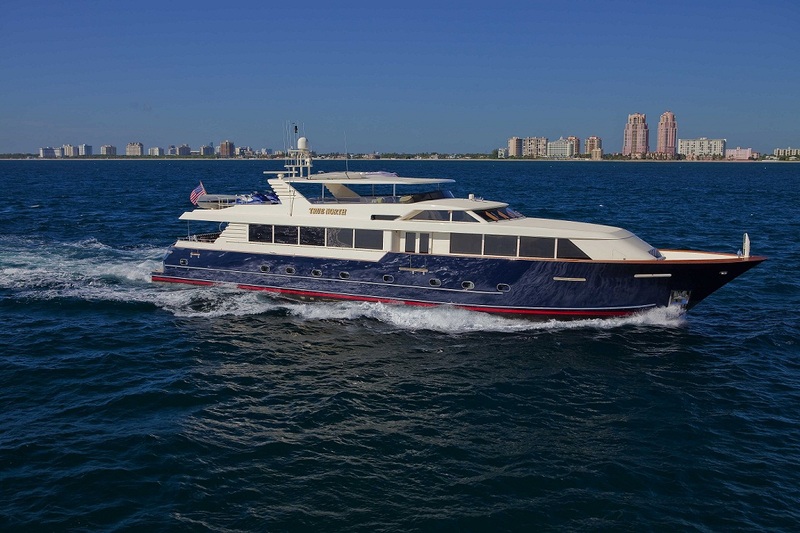 RJC Yacht Sales is pleased to announce our newest Central Listing on the 118′ 2000/2013 Broward Motoryacht, TRUE NORTH. TRUE NORTH received a refit in 2013 that included new paint, Pipewelders custom hardtop, new teak decks throughout, and upgraded electronics and audio/video. In addition, she received a complete new interior refit by Architectural Interiors with new carpeting, headliner, furnishings, window treatments, and soft goods including new exterior cushions and covers. Built in aluminum by US yard Broward Marine, TRUE NORTH was delivered in 2000 as a 118′ raised pilothouse model. Her custom interior has rich mahogany joinery throughout, accommodating eight guests in four spacious cabins consisting of a master suite with a king sized bed, two doubles and a twin, all with en-suite bathroom facilities. The main deck features a spacious main salon with a full bar. Forward is a private formal dining area, while further forward still is a comfortable country-style kitchen galley. TRUE NORTH also features a large aft deck that offers open-air entertaining and dining with seating, tables and a walk-up bar. Twin 1,350hp Caterpillar diesel engines give her a cruising speed of 15 knots and she is fitted with Naiad zero speed stabilizers. On display at the forthcoming Miami boat show, TRUE NORTH is asking $3,995,000.